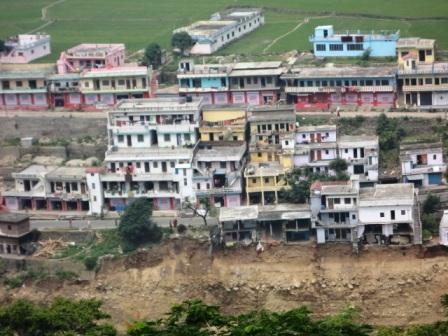 The vast devastation caused to life and property in the Himalayan state of Uttarakhand-India, has been dubbed as “Himalayan Tsunami”. The actual number of deaths and assessment of damage, destruction and devastation due to cloudburst and the flash floods will take time and effort. The torrential rain that lashed through Uttarakhand, the resultant floods and landslides swept away homes, cattle’s, mules, bridges and washed agricultural lands along with the main highways as well as the connecting village roads and footpaths. However, now with the rescue operations over, the relief work is in full swing though not being managed in an orderly way. Much of the interior villages are scattered in remote mountain area and have been cut off due to landslides. The extent of the devastation will be estimated once the connectivity to the villages is established. The economy of these areas were heavily depended on religious tourism which is now gone and will take years to recover. Many of the male earning members have perished in this disaster and with houses gone, livestock’s gone and agricultural land washed away, the surviving widows, young girls and boys are left with no options for livelihood and are desperately looking for some kind of relief and rehabilitation for their survival. implementing welfare and development schemes and other hill and rural development experts on its panel. It is not so easy to implement any rehabilitation plan on the ground without any proper survey of the persons who have died and were the sole earning members of the family besides the assessment of the loss of livelihood and damage to the agricultural and animal husbandry activities. The nature, type and quantity of damage and its ramification may vary from one household to other and from one village to the other. Migration from the hills to the foothill towns and in the plains has been going on since independence and this has not stopped even after the formation of the state in 2001. Migration of families from Garhwal hills have been reported after this Himalayan tragedy. Those who have survived and are well-off are planning to shift their families to urban centers and or in the plains. This rush of migration will be a challenging task for state government and it will further put pressure to urban amenities. Many families were dependent on religious tourism as many of them had business in the six month of Yatra season and many people worked in small hotels, Dabhas, shops, transport system, while many also were with their ponies for ferrying goods and pilgrims. Many Laborers were in involved in ferrying pilgrims and also other goods and services to the Kedarnath shrine which involved 14 Kms of up hill walk on footpath. The households depended on this religious tourism are the hardest hit, given the fact that the Yatra season is completed finished and it is unlikely to resume even next year given the destruction of the roads and bridges in the upper reaches. What will happen to these families now and how will they survive till the revival of the Yatras. What will be the alternative sources of livelihood and employment options for the newly unemployed persons? Without a proper livelihood options, we are likely to see an increased male outmigration from the region. Revival of rural economy either in Joshiyada a small town of Uttarkashi or Agustmuni, Chandrapuri, Rambada, Gaurikund in Ridraprayag district and lot of other small towns and halting places, will be a challenge to all who are planning tourism activities in Uttarakhand. What happens to the youth and other who have taken loans to establish their business in the pilgrim route? What happens now to projects designed on the basis of religious andhouse river bank.JPG other tourism attraction in these areas? What will happen to the local man who supplied milk, the barber, the small shopkeeper, workers and helpers in dharmshalas and to the Pujaris and assistants on various temples enroute? What will happen to many of the youth from Ghat block- Chamoli, who were part of pony community. Will they do now and where will they go now to make a living. The Health and education system was already in shambles in the Hills and now with the damaged schools buildings and health centers, one can only imagine the scenario. This entire scenario is off-course a great challenges for the state and society. The government needs to constitute task forces for all line departments to assess the loss and provide quick remedial measures as a short term measure. For example, if students are not able to reach the school due to damage of bridge on river and or small stream, the school can be shifted nearby to continue this teaching session. Similarly, the food department has to ensure that ration is being transported by mules to the nearest PDS shop. Health department has to ensure that essential medicines are being provided to the villagers through ANM and ASHA workers. For long term solution the process of participatory planning at all level is essential. Consultation with affected families is essential to identify actual needs of rehabilitation at family level. By merely making a plan sitting in Dehradun would not bring about a sustainable solution. Counseling and rehabilitation centers are required to be opened at panchayat levels so that the need for rehabilitation can be assured and a long term strategy is proposed. The best way to mitigate the impact of disaster on local community is to open up and start the Yatra again by developing foot tracks as soon as possible for all the shrines-Chardhams. This will help many families to start their income generating activities and thus bring normalcy in their life.